FOR 10,000 YEARS THE HOPI PEOPLE HAVE LIVED ON THE MESAS OF NORTHERN ARIZONA. 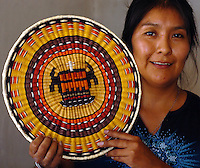 These fine artisans have created true masterpieces of Indian art, and the Hopi collect top dollar for their pottery, baskets, and weaving. 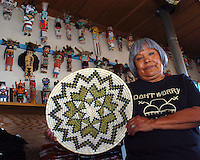 This religious community is very close-knit and clings to its reservation, which is surrounded by the Navajo Nation.